At the age of 19 and weighing in at 12 stone, using a wooden, hook ladder and leather belt to scale a building seemed like a good way of going up in the world. 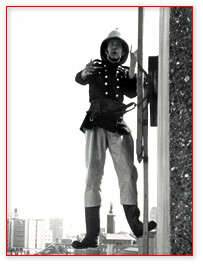 35 years later, and a few pounds heavier, you start to question if there is a better alternative… Fire Risk Assessment. London Fire Risk Assessments rose like a Phoenix, from a distinguished career in the London Fire Brigade. The principle person, the man in the picture is Clive Lewis TIFireE. Clive formed London Fire Risk Assessments with the implementation of the Regulatory Reform (Fire Safety) Order 2005, after a career of Operational Fire and Rescue Service of over twenty years. A Fire-fighting career taking him from the heights of the roof’s of Buckingham Palace to the depths of the tube tunnels at Kings Cross. Clive took his Operational Experience into the London Fire & Emergency Planning Authority, Fire Safety Office, and culminated his service with the position of Watch Manager A, Fire Safety, Inspecting Officer. Clive is a Technician in the Institution of Fire Engineers and is accredited on their Register of Fire Risk Assessors and Auditors as a Fire Risk Assessor. In employing London Fire Risk Assessments you are essentially employing Clive Lewis. Every Fire Risk Assessment commissioned from London Fire Risk Assessments is either carried out personally by Clive or validated and authorised by him before release to the Client.